How to Measure Head for Full Lace Wigs or Lace Front Wig? When a woman is looking to wear a lace wig, she wants to achieve the most natural look possible. A quality lace wig makes a world of difference in how good the wig looks on the wearer. A correctly fitted lace wig is just as important. A custom lace wig can look as authentic as natural hair with the right fit. Fitting a lace wig to the head requires precise measurements. These will guide the wig maker when producing the lace wig unit and ensure that the outcome is a beautiful head of hair. Perform the steps two or three times to double check your measurements before giving them to the wig maker,you can't wear the wig as well if the size is too big,you'll feel uncomfortable if the wig size is not fit your head perfectly. because all sellers won't allow returns if you make a mistake in your sizing. Get the right sizing for your full lace wig or lace front wig,since you you desire comfortable wearing and do not want to go for something that tells everyone it is fake. 1.Measure circumference of your head using a tape measure. Place the starting end of the measuring tape in the middle of your natural hairline at the top of your forehead.The tape measure should follow your hairline in a round position from your head to your neck for the first measurement.Hold the beginning of the tape in place while you wrap the tape along your hairline, behind the ear, around the base of the skull and back up the other side of your head. The second measurement should be from your forehead all the way to the nape of your neck. This should be done perfectly straight. The third measurement should be from ear to ear across your front hairline. After this, measure ear to ear over the top of our head. Take a temple to temple measurement, followed by the measurement of your back hair line. 2.Bring the tape around until it meets with the end you are holding in place. Pinch the tape on the portion of tape you just wrapped around your head. Your finger will fall on the circumference measurements. 3.Measure your front to nape. Place the beginning of the tape at the center of the hairline again, but this time, you will move along the top of the head, so keep the tip of the tape pointing toward your nose side. 4.Bring the tape over the top of the head and down to the nape of the neck. Keep the tape close to your scalp. Place a finger on the tape at the nape of the neck and pinch the tape. This is measurement fo your front to nape. Measure from ear to ear across the hairline. Place one end of the tape at the top of one ear and lead it over the forehead, across the hairline, to the top of the other ear. This is measurement for your ear to ear forehead. 6.Measure from ear to ear over the top of the head. Place the beginning of the tape at the top of one ear again, then bring the tape over the top of the head to the other ear. This is measurement for your ear to ear over the top. 7.Measure the back of the head. Place the beginning of the tape measure at one temple of the head, with the tip pointing toward your eyes. Wrap the tape around the back of the head to the other temple. This is measurement for your temple to temple. 8.Measure the nape of the neck. This is measuring the width of the nape of the neck, which is narrow. Use both hands and feel the nape of your neck, then hold the measuring tape at the beginning tip with one hand. Use the other hand to hold the tape across the width of the nape of the neck,this is measurement for your size of nape of neck. 9.Write down your measurements and confirm that they are correct. Confirm them further by taking the measurements one more time. Take the full lace wig and put it on a wig stand. Measure all the sides in the same fashion you have done for your head. Confirm the correctness of your measusurements and the wigs. 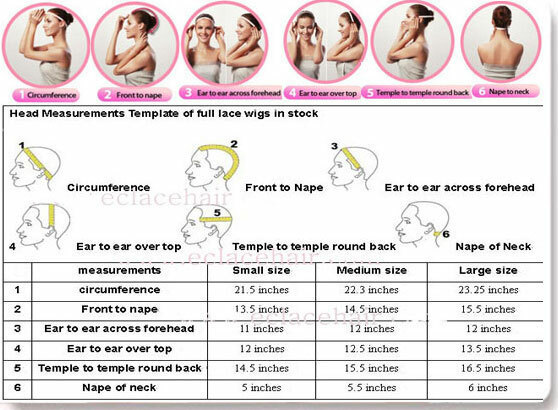 All the steps are the same as measuring for full lace wigs,but since lace front wigs have adjustable straps at back and wig cap is stretchable,so the circumference of the wig should be 1 inch smaller than your head to get a comfortable wearing experience.